Holding up signs that read “#BelieveBlackGirls” and chanting “protect our children,” more than 100 students, families and concerned community members rallied outside of East Middle School on Tuesday afternoon in the cold and snow to protest the alleged strip search of four 12-year-old black girls by school officials on Jan. 15. Organized by the Progressive Leaders Of Tomorrow (PLOT), a grassroots organization that aims to empower and liberate marginalized members of society, the rally called for the resignation of Assistant Principal Michelle Raleigh, Principal Tim Simonds and the school nurse. Roseanne Vasquez, 33, of Binghamton, said she attended the rally to call for the resignation of the school officials responsible and to support the four girls. 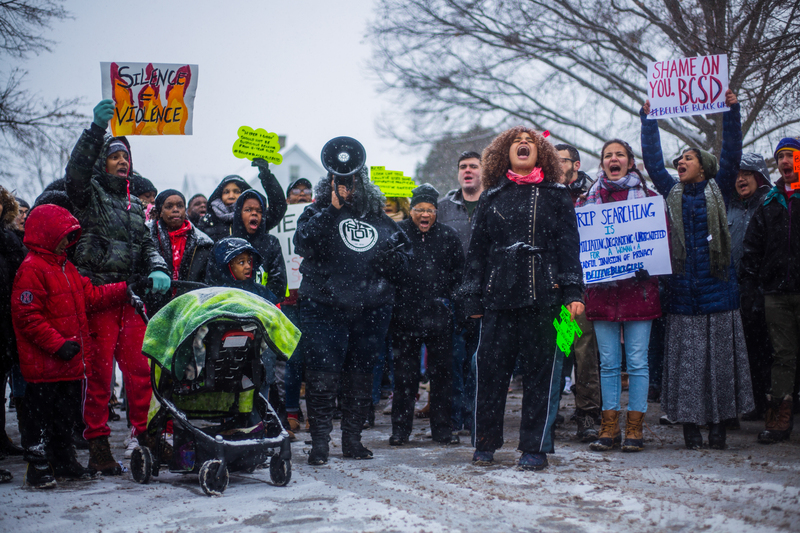 For Tyron Brown, a second-year graduate student studying public affairs, it was important to participate in the rally as these alleged incidents affect the whole community, not only black women. According to PLOT’s Facebook post, the four students were strip-searched by the school nurse and Raleigh — on the behest of Simonds — on the suspicion of possessing drugs. No drugs were found and the students’ parents weren’t contacted to obtain their consent for the searches, according to the post. 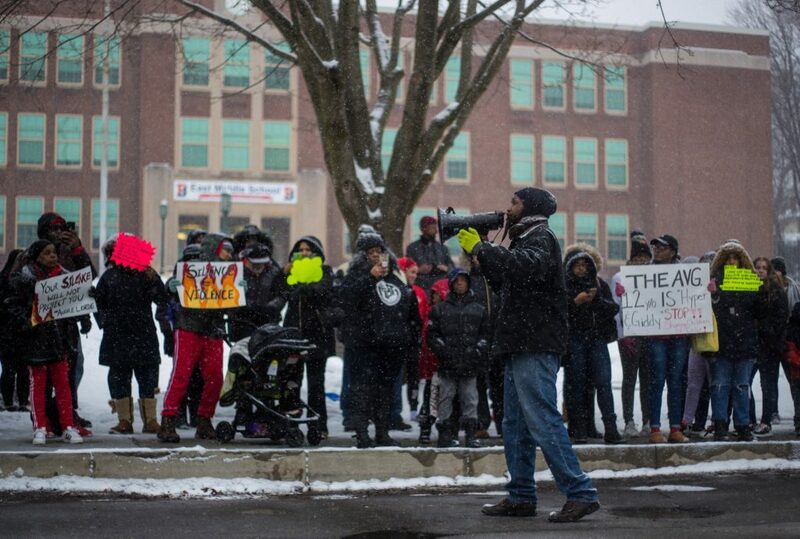 The rally was organized by PLOT exactly two weeks after the alleged strip search occurred and one week after approximately 200 community members questioned the Binghamton Board of Education about the incident at a board meeting. In response to the post, the Binghamton City School District released a statement on Jan. 24 maintaining that school officials had not conducted a strip search but rather a medical evaluation. According to the statement, medical evaluations may require the removal of bulky outside clothing to expose an arm. However, in a joint statement released on Jan. 25, the parents of the four girls upheld their daughters’ testimonies that they were strip-searched at the middle school. According to the statement, three of the girls complied to sobriety tests and a strip search while one of the girls complied to the tests but refused to remove her clothing for the search, which caused her to be sent to in-school suspension. The incident has drawn increasing media attention in recent days. On Wednesday afternoon, a day after the rally, Gov. Andrew Cuomo announced in a press release that he will call on the New York Education Department to launch an investigation on the strip-search allegations and has directed the New York State Police to offer their assistance to local authorities. According to Roderick Douglass, PLOT’s social media coordinator, the organization is going to follow the wishes of the families of the four girls and continue to advocate for them. On Jan. 29, the day of the rally, the Binghamton City School District released another statement reiterating that there was no evidence that a strip search was conducted by administration. According to the statement, the school is using an independent third-party firm, Ferrara Fiorenza PC, to conduct a review of the incident. However, following the release of the most recent statement from Binghamton City School District, Korin Kirk, a member of the Binghamton Board of Education, released a personal statement on Facebook claiming her support for the four girls. According to her post, Kirk also experienced traumatic experiences while attending Binghamton City Schools, including East Middle School. According to Douglass, it is only through the support of the community that change and accountability is possible.